I recently read an article (don’t ask me to remember where) that compared Morbier to Humboldt Fog. Naturally, I was intrigued since my love for the Fog is well-documented. But it turns out that the only thing the two cheeses have in common is the thin line of vegetable ash running through their centers. Otherwise, not so much. 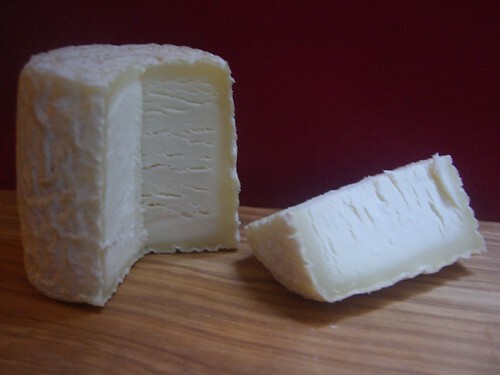 Humboldt Fog is a goat’s-milk cheese; Morbier is made from cow’s milk. 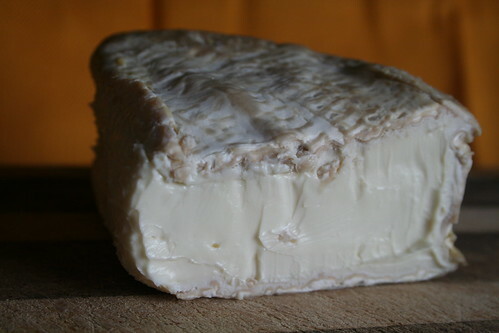 Humboldt Fog is from California; Morbier is French. 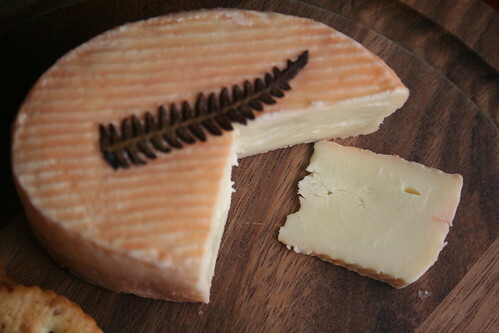 Humboldt Fog is amazing; Morbier is not. 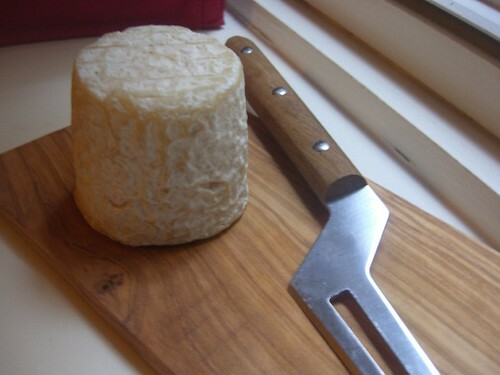 I’m not saying Morbier is a bad cheese – it was perfectly pleasant enough with a soft, slightly rubbery interior and stinky but not-too-funky aroma. 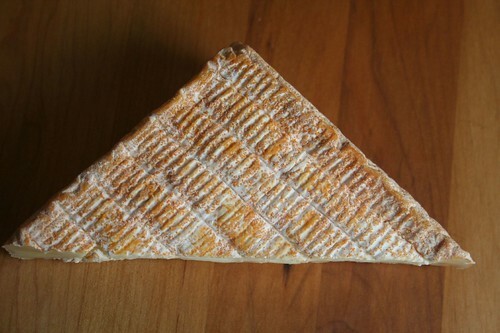 But the taste was so mild that my tastebuds said, “OK, next, please.” Maybe it’s because a leftover cheese – some producers, like Jean d’Alos, make it from the leftover curds from the Comte they also create. Morbier is the meatloaf while Comte is the steak. But don’t cry for Morbier. 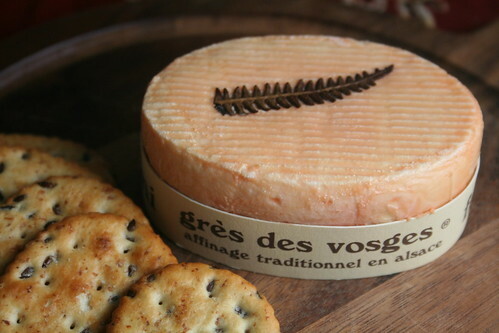 It’s an innocent cheese just trying to make its way onto your cheeseboard. 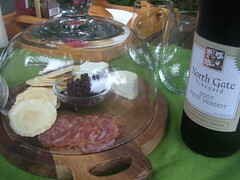 And since it’s so mild, it’s a good choice to serve if you don’t know how adventurous your guests are with cheese. Pair it with a Beaujolais, Gewurztraminer or Pinor Noir. A cheese that comes snuggly tucked in its own crock has to be good, right? 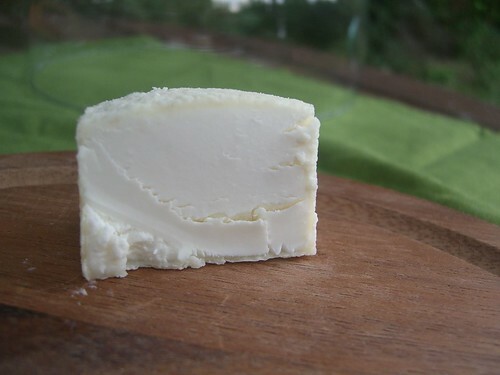 That was my assumption when I picked up this cute little cow’s-milk cheese at Surdyk’s last week. Though St. Marcellin doens’t fit into our goat-cheese theme, it is a fine cheese to include on your cheeseboard any time of the year. St. Marcellin is produced in the Rhône-Alpes region of France, which is in the southeastern part of the country – an area known for fabulous food. 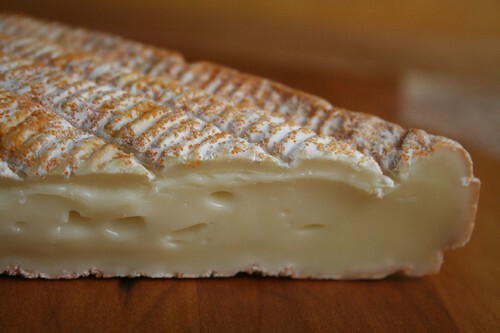 If you travel there, you’d likely find a raw-milk version of St. Marcellin, but here in the United States, we have to make do with the pasteurized variety, which isn’t really a sacrifice because the cheese is so damn good. 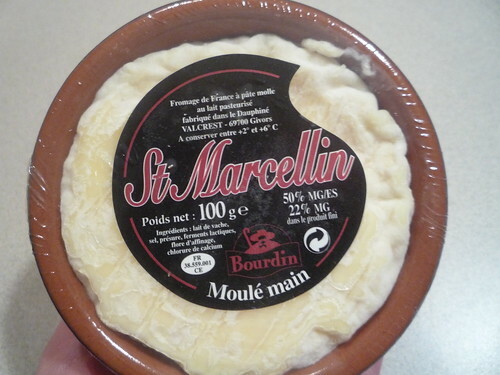 Ignoring the rule that you should let a cheese sit at room temperature for one hour before eating it, I let my St. Marcellin sit out for three hours (a.k.a. dinnertime and two episodes of “Mad Men”). By then, the paste was a puddle of ooey-gooey deliciousness, just the way I like it. It was more practical to eat it with a spoon than with a knife at that point. 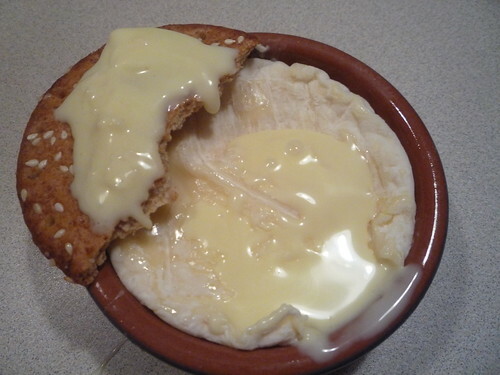 The taste wasn’t unlike Chaource – a creamy, slightly mushroomy blend of flavors. It had the decadence of a special-occasion cheese, but I never save cheese for special occasions – a Tuesday night is a good enough reason for me! And the three-ounce size almost makes it guilt-free – you know you can’t overdo it because it’s not a large wedge of cheese. If you enjoy St. Marcellin with a glass of a heart-friendly red wine, like a Syrah or a Châteauneuf-du-Pape, you could even consider it a healthy snack.